Super comfy, fleece footed onesie for women will keep your whole body toasty from couch to kitchen and everywhere between. These Eeyore onesie pyjamas a fun gift for any Winnie the Pooh fan. Soft blue polar fleece with contrasting pink cuffs. They feature a 3D graphic of the lovable character on the front left and a hood designed to look like Eeyore's ears. The pyjamas have elastic ankles, textured soles and are tag free for added comfort. Keep warm and comfy in these pink sheep footed pyjamas. Non-skid soles add a bit of practicality to these whimsical, super-soft footed pajamas. Keep warm and comfy in these frog footed pyjamas. Non-skid soles add a bit of practicality to these whimsical, super-soft footed pajamas. Keep warm and comfy in these flying pig footed pyjamas. Non-skid soles add a bit of practicality to these whimsical, super-soft footed pajamas. Keep warm and comfy in these frog princess footed pyjamas. Non-skid soles add a bit of practicality to these whimsical, super-soft footed pajamas. Keep warm and comfy in these multcolored duck footed pyjamas. Non-skid soles add a bit of practicality to these whimsical, super-soft footed pajamas. Keep warm and comfy in these zebra kisses footed pajamas. Non-skid soles add a bit of practicality to these whimsical, super-soft footed pajamas. Keep warm and comfy in these monkey pattern footed pyjamas. Non-skid soles add a bit of practicality to these whimsical, super-soft footed pajamas. Baby Blue Onesie with allover ducks and bubbles print. Extra roomy, easy care polar fleece perfect for lounging around. Definitely the perfect pyjamas! Adorable Felix the Cat, the wonderful wonderful cat Onesie! 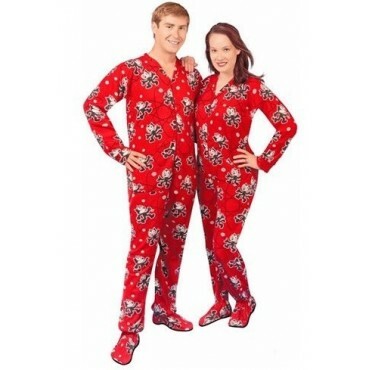 These unisex footed pjs are extra roomy and definitely the perfect pyjamas for getting into a fix ! Easy care polar fleece, perfect for lounging around or reaching into your bag of tricks. You'll love hiding out in our Pink and Green camo print, incredibly comfortable onesies pyjamas, the best way to spend those cold winter nights. Polar fleece footed onesies for those who are looking for warmth and comfort ! Perfect for just lounging.